Since 1986, Dollywood Theme Park has become synonymous with the East Tennessee region. Boasting 7 roller coasters and several other exciting thrill rides, this theme park in Pigeon Forge, Tennessee provides plenty of excitement for a day's adventure. Entering Dollywood Theme Park, visitors step foot onto Showstreet, where you will find several shows at the Showstreet Palace Theatre and Celebrity Theatre to keep guests entertained throughout the year. This area is also near the "Chasing Rainbows" museum, an excellent exhibit that tells the story of Dolly Parton and her Smoky Mountain roots. Enjoy the twang of the banjo as The Smoky Mountain string band plays authentic mountain music during the entire season. During the holiday season, enjoy several Christmas programs to get you into the holiday spirit. Moving through Dollywood, guests pass through several themed sections highlighting aspects of the region's culture and history.Enjoy the nostalgia of the Country Fair, where you can ride the "Scrambler", the "Lemon Twist", or the "Wonder Wheel".Don't pass out on a chance to ride on the nearby Village's beautiful carousel, complete with every animal imaginable. In Craftsman's Valley, you can watch as a blacksmith forges pieces of iron on his anvil. Hop aboard the Dollywood Express in the Village to see the natural scenery that surrounds the park while the authentic 110-ton coal-fueled steam engine powers the cars across the tracks. Dollywood Theme Park's Exhilarating Thrill Rides! Dollywood Pigeon Forge offers plenty of opportunity for the thrill-seeker in your group to get their adrenaline pumping. With 6 roller coasters and several other thrilling amusement rides, there is no shortages of activities to give guests an adventurous rush. Lightning Rod - Dollywood's newest coaster doesn't disappoint. Opened in March 2016, Lightning Rod is the world's fastest wooden coaster. Not only does this hot rod inspired ride reach a top speed of 73 MPH, but it's also the world's only wooden launch coaster! "Thunderhead" Roller Coaster - Dollywood Amusement Park's famed wooden roller coaster. Constructed from 700,000 board feet of Yellow Southern Pine, the 22 turns and 32 crossovers of this coaster give riders as true rush as the cars rattle along the wooden coaster. Feel the rush of the mountain air as you drop 100-ft at speeds of 55 mph on this impressive coaster situated in Timber Cannon. "Firechaser Express" - A newer addition to the Dollywood Theme Park coaster family is the first dual-launching coaster in the United States. The cars on this coaster launch forward and backward, making the turns of this ride even more thrilling. "Wild Eagle" Roller Coaster - "Firechaser Express" isn't the only innovative coaster at Dollywood Amusement Park. , the first winged coaster in the U.S. allows riders to soar 21 stories with nothing but air surrounding them! The hairpin turns and drops on this ride will make your heart race with excitement as you fly like an eagle through the skies. "Tennessee Tornado" - This classic roller coaster features a unique 110-ft spiraling drop. Reaching speeds of up to 70 mph, this twisting, turning ride is a must-see on your trip to Dollywood! "Mystery Mine" - With a hair-raising 95-degree, 85 foot drop, this innovative coaster earns rave reviews for its design, aesthetic, and memorable surprises. "Daredevil Falls" - Maybe you'd like to cool off from the hot summer heat of the Smokies with this harrowing 60-ft drop at 60 mph will give you the chill and thrill you're craving. "SkyZip" - Perhaps you'd like to speed through the treetops like a bird, this thrill ride allows you to speed down lines that reach lengths of up to 1,000 ft as well as walk across a 100-ft long elevate swinging bridge. Those looking for an electrifying theme park adventure will have no shortage of rides to choose from within Dollywood Theme Park! Dollywood Theme Park stays true to promoting the culture of the region by supporting artisans who practice time-honored, traditional crafts. Mostly located in Craftsman's Valley, these artisans will amaze visitors with the care and skill with which they create their products. Woodcarving Shop - See craftsman shape wood into beautiful sculptures. Rainbow Glass Factory - Watch glassblowers carefully control their flame to bend and shape glass into delicate figurines. Sweet Shoppe - Enjoy the tasty craft of candy-making at this shop where visitors find classic country favorites such as potato candy and peanut brittle. Old Flames Candles - Bring home your own hand dipped candle. The Grist Mill - Buy some stone ground corn mill from to make your own creations at home. 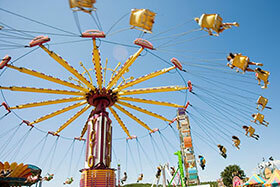 Throughout the year, Dollywood Amusement Park offers guests a wide variety of shows, activities, and entertainment for each season. In the spring, enjoy a glimpse of entertainment from all corners of the globe with a month-long celebration of international food, music, and dance at the Festival of Nations Celebration! Enjoy the twang of Appalachia's native music, bluegrass, while you enjoy delicious barbecue during the hot summer days at Barbecue & Bluegrass! Dollywood's Southern Gospel and Harvest Festival features plenty of pumpkins, gospel music, and fall-themed fun! 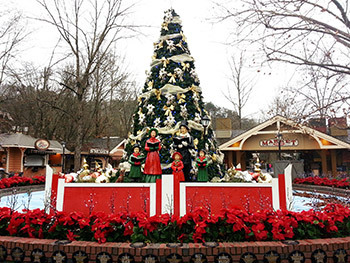 Celebrate a Smoky Mountain Christmas at Dollywood! Winter brings with it carols, Christmas lights, and more than enough holiday cheer. With shows such a musical production of "A Christmas Carol" and a nativity, beautiful decorations, and even Santa's Workshop, Dollywood Theme Park becomes a holiday playground to get you in the season's spirit! With all there is to see and do in Dollywood Theme Park, it will come of no surprise to visitors when they work up an appetite. Luckily, Dollywood Pigeon Forge boasts over 25 eateries throughout the park to ensure everyone's belly is filled with scrumptious Southern food. Whether you choose Aunt Granny's all-you-can-eat buffet or Miss Lillian's Chicken House, the food is guaranteed to be finger-licking good. Funnel cakes, hot dogs, popcorn, and more are scattered in all the areas of the park, if you're craving more of snack while walking through the park. Of all the delectable treats in the park, the cinnamon rolls from the Old Mill bakery have earned widespread acclaim for their melt-in-your-mouth goodness. As one of the biggest and best attractions in the Smoky Mountains, we think everyone should experience family fun at Dollywood at least once! Before you plan your visit to Dollywood, be sure to check out our post with Dollywood Theme Park tips for enjoying at Dolly Parton's signature attraction!